You can follow me on twitter! My username is sushiday. I finally had the opportunity to play Halo 3 with Son, and I loved it. I may have had more fun playing than he did! I really want to audition for So You Think You Can Dance. Not so much for the whole TV thing, but… seriously? Any opportunity to work with that many world-class choreographers is worth whatever it takes! I am a super-duper night owl. Still up at 5am, and not really tired. Luckily I have the freedom to get up whenever I want, so the late nights up working are not a problem! 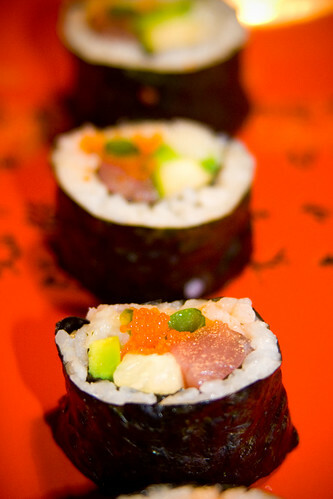 Like I promised, here’s your sushi recipe! Enjoy! 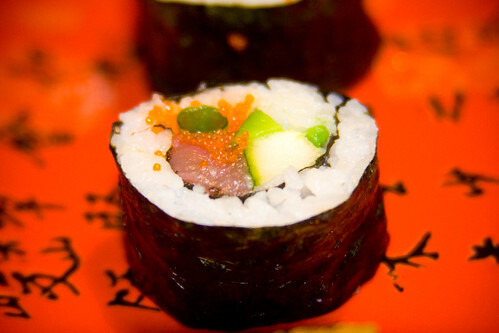 Roll the sushi, using avocado, cucumber, a stalk of green onion, tuna, a tsp of Siracha, and a little tobiko as your fillings. Cool recipe. Just noticed the nutritional info tab – you go to a lot of effort, don’tcha? You are very interesting, I don’t know what took you so long! I LOOOOOOVEEEE Quantum Mechanics! The philosphy behind it, that it. Forget the math. I’m not Albert Einstein when it comes to math. Congrats on your degree. That’s a big thing. T-shirts! I will have to pick one up! That is a great idea by the way. Maybe I will give it a try with one of my photos. Thanks! You would have loved the class that I just took. It was Logic and Philosophy of Science, so the hardest math we did was vector math, and even that he spent several classes teaching us. Most of the class came from philosophy… there were only two of us with physics backgrounds. “Sushi day” What a cool blog name :] My vote is: Let’s make every day a sushi day. Hey Allison! Congratulations on graduating. That is such an achievement! Enjoy the day and be proud of yourself. Wow, this is such a great web site to visit! In the picture, do you see those tiny orange balls on top of the roll? Those are tobiko. They are flying fish roe, often used in sushi.